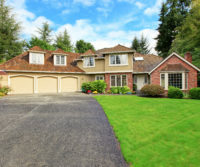 Posts Tagged "driveway paving in Baltimore MD"
Your driveway is one of the first things that guests will notice when they come to your home. If your driveway is cracked, worn or in disrepair, it is probably time for a fix. By fixing your driveway or installing a new one, not only will it look better, but you can increase the value of your home. When you need high-quality seal coating or driveway paving in Baltimore MD, look no further than A&M Asphalt Paving. Whether you are a private or commercial property owner, we have specialized paving solutions to suit your needs. We have more than 30 years of paving experience under our belt. Therefore, you can trust us to get the job done to your satisfaction. Whether your driveway needs a facelift or your gravel driveway needs paving, we can improve your home’s entire aesthetic with fresh, new asphalt. No job is too big or too small for our eager team. Our residential and commercial clients call on us for everything from patching to building a new driveway. At A&M, we have the experience, technology, and skills to complete high quality driveway paving. Additionally, we are able to maintain and repair existing driveways and parking lots. Commercial property owners know how important attention to detail is when it comes to maintaining their premises. Depend in A&M Asphalt Paving to provide expert seal coating and paving services with a highly professional finish.